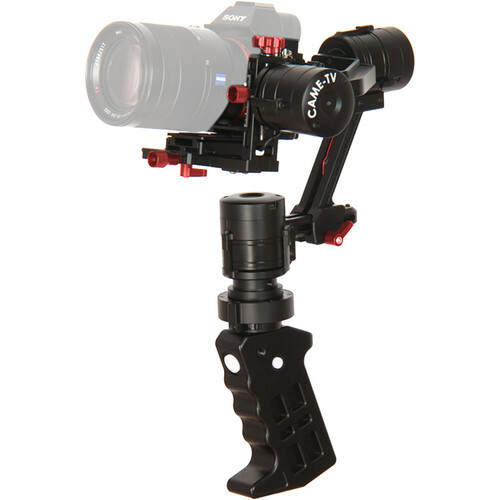 The CAME-Single 3-Axis Handheld Camera Gimbal from CAME-TV is a single-handed stabilizer that supports loads up to 2.6 pounds, making it suitable for use with compact cameras such as the Panasonic GH4, Sony a7S, and Blackmagic Pocket Cinema Camera. It utilizes three motors that stabilize the camera along the pan, tilt, and roll axes. This compensates for shakes, vibrations, and other unwanted movements, allowing you to capture smooth, free-floating shots. The system offers multiple operation modes for increased creative possibilities. You can choose to lock the camera in place along all three axes or have the camera smoothly follow your pan and tilt motions while keeping the horizon level. There is also a Commixture Mode, which locks the tilt axis while allowing the camera to follow left and right panning movements. Modes can be easily switched using a joystick, which can also be used to adjust camera pan and tilt position. The system includes a quick-release plate for mounting your camera. As with sled-style stabilizers, your camera needs to be balanced in order to get the best performance. The balancing process is made easier thanks to tool-less adjustments along all axes. On the bottom of the handle, you'll find a 1/4"-20 threaded hole for mounting the stabilizer on an additional device, such as a slider, jib, or tripod. An additional 1/4"-20 threaded hole is located just above the handle for convenient mounting of a monitor without throwing of the camera balance or exceeding the load capacity of the motors. The stabilizer is powered using two included 18650-type, 2500mAh rechargeable lithium-ion batteries that slot into the handle and provide around 20 hours of use on a full charge. A battery charger is also included, along with a hard carry case for storing and transporting the system.